Motorola ATRIX HD owners were the most satisfied in the U.S. 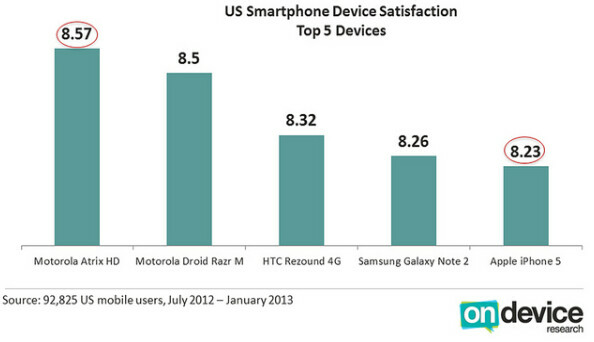 So which smartphone has the most satisfied owners in the U.S.? The Apple iPhone 5? Guess again. The Samsung Galaxy S III? Nope. 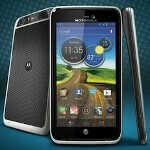 93,825 U.S. smartphone owners were asked how satisfied they were with their current smartphone and the winner was the Motorola ATRIX HD with a score of 8.57. The survey was taken from last July through the end of last month and Motorola was well represented because the Motorola DROID RAZR M was next with a score of 8.5. Motorola's build quality is quite impressive and that might have led to these results. In third place, the HTC Rezound 4G scored 8.32. The Samsung GALAXY Note II is fourth with an 8.26 score followed by the Apple iPhone 5 which finished fifth with a score of 8.23. In the U.K., the Apple iPhone 5 placed higher, coming in second despite a lower 8.21 score. With an 8.47 score,the HTC One X led the way in the U.K. with the Samsung GALAXY Note II (8.18) third. The Samsung Galaxy S III mini and Samsung Galaxy S III finished fourth (8.18) and fifth (8.09) respectively. Surprised? It is an interesting survey as it looks at satisfaction rather than popularity and the results could give Motorola the optimism that it is heading in the right direction, at least in the U.S. where the Motorola X is eagerly awaited. Really surprised at Moto having such a strong showing. I didnt really keep up with the Atrix HD. And in brand preference Moto over HTC, Nokia and Samsung? Almost 94,000 ppl surveyed... Nice to see Moto still has a loyal following. They really do make nice phones. But it didn't not mention how many users were questioned in each phones What if there were only 100 Motorola ATRIX HD users out of 93,825? Is that really reliable data? I agree...someone at another site mentioned the GS3 not in the chart, but the Rezound is. I said maybe not enough GS3 owners took the survey. Whatever the case.....there are still some Moto fans out there. I am sure there were enough GS3 owners questioned as they are almost everywhere in the world...the same goes to Iphones But Motorola ATRIX HD? Well If I found an application what I need with 4.7 rating out of 5 by 20 users... I dont buy it cause I just cant' trust it yet But 4.5 rating by 2,000 users? Yes.. why not believe it? Old device / mid low range device tend to have higher satisfaction than flagship... I said it before and I say it again... These user tend to have more positive view toward their device, and lags are not deal breaker to them at all... Because they bought it cheap, they expect these happen, whereas the old device, of course they stay high satisfaction, will you happy that your device can stay healthy and running like a champ? why flagship user not happy? Because they expect too much, afraid of obselete, and they always keep purchase the highest spec every time and end up being spec slave... Why change your device when android is already perfect? Why being so slavery towards spec? Agree. Those impractical, specs-crazy c*nts get unbearable too often, trolls included. Sorry 'bout the language. Just saying..
WELL IF THEY ONLY TOOK SURVEYS FROM ABOUT 2 PEOPLE THAT BOUGHT THE PHONE AND THAN ASKED THEM HOW THEY LIKED OF COURSE THEY WOULD SAY THEY LOVED IT. BESIDES LIKE ALL ANDROID PHONES THE POS WAS PROBABLY FREE AND THE SALES PEOPLE WERE GRINNING AT THE DUM9 CUSTOMER WHO WENT IN AND GOT IT OFF THEIR DUSTY SHELF. It's an outdated POS that the sheep will always buy. Dark, I see you on here quite a bit with your iPompoms on. You seem to always be excited when an article favors apple. I do not understand fanboyism, especially when it clouds judgment. He's definitely the biggest fanboy on this site. Wow! I'm definitely the biggest fanboy on this site? LMAOOOOO!!! Ok if u say so... I just wonder why u constantly attack the iPhone, no matter what the article is about. Can u please b intelligent, and mature for one sec, and just explain why u attack the iPhone like u do? Please let's just chat like adults for a sec? Is that ok with u? I'll have an adult conversation with you when you start spelling like an adult. Lol ok I see where you are at with this, so I promise you this will be my last post/response to you. I meant no disrespect, and please do me the favor and don't comment on mine. Network tech wise the most excitement I had this year was when I snagged my note 2 to b honest. I'm primarily an iOS user, but I felt that device was way more innovative than my ip5. The ip5 is still my go to device due to my being more deeply vested in the iOS Eco system. To respond to your statement tho I'm not a fanboy, just a user of iOS and android. The Note 2 is for sure an amazing device. I prefer Nexus's (Nexi?) myself, and I'll respect that about using an iPhone, as long as you're not using it because "Ooo shiny Apple logo". What do you think of the Xperia Z? I know it will never happen but I would have loved to have seen a Motorola Windows Phone.....Oh the pain....the pain. A Moto WP or Nokia WP would be the only ones I would get. Sony and HTC have great build quality too, the Titan 1 was a work of art, very highly rated on att's website when it was carried too. The atrix hd has bad battery life but despite that is a very good phone, running jelly bean, with kevlar back, hd screen, water repelent nano coating. And quite cheap since it's launch. not a thumbs down but I will have to disagree. When the phone first came out, yes horrible battery life I hated it. Ever since a few updates since September and even better now with Jelly Bean it lasts as long as most phones with regular use. I have to hand it to Motorola, I never thought their phones were good. This phone is is swinging me a different way though. well i'm happy to hear that, I have a razr hd and battery life rocks. Based on your comment and this poll I'm starting to consider buying an atrix hd for my girlfriend.